When we are young, we are often not able to make the distinctions between art and protest. Sometimes, artists can’t do this either, but it’s right in their way to communicate some messages when they manage to get away with this prerogative and succeed. 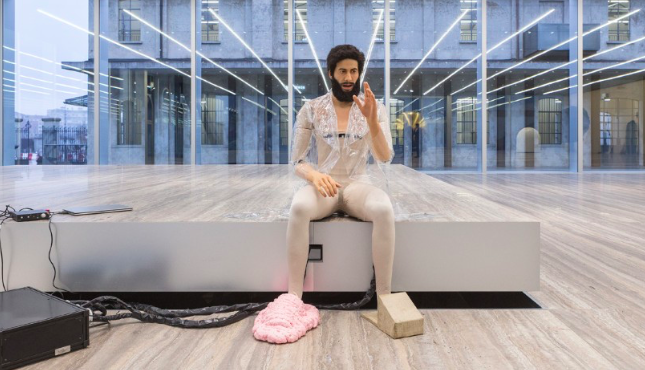 The fact is that the London-based, Polish artist Goshka Macuga separates herself from this quiproquo with her use of sources, suggestive narrative, cultural knowledge and illusionary technique. In the words of Nikolai Gogol, Macuga’s persona in the art world resembles the truth and lets us know that everything can happen to a man if one’s not fully awake to explore it and relive it. You are a graduate from Central St. Martins College of Art and Design and Goldsmiths, University of London; but also you describe yourself as a “child of communism.” How do you think you became what you are? I left Poland in 1989 after making two attempts to study in the Art Academy in Warsaw. Both times I did not manage to get accepted. I then came to London where I studied at St. Martins College and Goldsmiths. When I left, Poland was on the brink of a massive transformation, but I remember it feeling claustrophobic and I felt impatient, I wasn’t prepared to wait for the change to take place so, instead, I made a change by relocating to a new context and a new country. My national identity or my background obviously have an impact on how I relate to history and not only the history of my country. Big gaps in the historical narrative of the country are still surfacing in Poland now. My life and my education in communist Poland have taught me that, instead of referring to the readily available written histories, one needs to search further for some sort of truth. The other observation resulting from my experience of moving to a new context is that one has to project oneself to a new reality to identify oneself. I guess that I have been doing it through my working method. Do you remember what were your thoughts before starting to develop your career as an artist? I was always interested in creative fields such as dance, music, design, fashion and art. As a teenager, I was more into music/dance than visual arts but finally chose to go to a secondary art school in Warsaw called Wojciech Gerson Liceum. Studying there gave me basics skills in painting, sculpture, design, photography as well as knowledge of art history, literature, physics, math and political science. I had an idealized view of reality on one hand and, on the other hand, existential crises were my favorite topic of conversation. Experience can make you more flexible or more stubborn? Depending what one’s experience in life is; i.e. being open and flexible can allow one to achieve a lot and enjoy it, but flexibility can also bring disappointments. Saying that, perhaps a flexible person does not feel any disappointment. Being stubborn can be productive and destructive at the same time as it influences how one forms relationships with people who might be fundamental in achieving one’s goals. The question is of what are one’s standards and how much is he/she prepared to compromise. What’s your current position about the meaning of contemporary art? I am not sure if for an artist living today it is possible to dismiss the opportunity to comment on what is currently happening in the world. If one chooses not to do so it is probably because they cannot really find a way of dealing with it, or process it and instead chose to escape the subject all together. It’s definitely easier to position oneself towards the past or history rather than to deal with what is happening today. Maybe the issue is about how one can express one’s anger and frustration about what is going on and making art about it is not enough. This is where it’s good to categorize which art is truly political i.e. makes a difference. Art can be political without the artist’s intention to make it political. By contrast, art can also and often is about politics with the artist’s intention to make it political (like some art that I made in the past) which does not guarantee any particular outcome and does not necessarily make any impact on anyone or anything. The recent election of Donald Trump in the US and Brexit in the UK has shocked millions of people. It would be hard to pretend that this has not happened and we can all happily sit in our studios or offices and produce art as if the seeming shift in the political world around us did not exist. The new political leaderships of these countries and the reality it will create will impact millions of people and certainly art or culture and it’s already doing so. We just don’t know the extent of it yet. Art can be made to promote different attitudes and raise awareness but it also gives people a feeling that they are united in what they believe in. You once stated “it’s really about looking at the art as an institution.” Could you please explain what do you mean by ‘institution’? In this statement, I probably referred to art in a broader context, i.e. not just art as object produced by the maker/an artist but everything else that relates to it such as: art schools, museums, galleries, art fairs, auctions, biennales, documents, art collections and the economy that comes with it. Even the actual practice of being an artist can be considered an establishment and certainly a service. Without the service of the artists that is art the rest of the institutions listed above could not exist. The institute of art has a social purpose and being an artist is today considered a profession. That, of course, has both good and bad connotations. As a writer myself, I know that we [writers and journalists] have to consider a few things in order to expose a piece; for some reason I think artists enjoy more freedom when creating and exhibiting their work. Is that true or you are always struggling with the idea of how people might react to your work? Criticism can be very productive in the development of one’s artistic practice when it’s posed by a respected/trusted source. I don’t really struggle with the idea that some people don’t like my work. Naturally, when the work is exposed to the public opinion, sometimes the response is negative. I was once called “consensual artist” by one of the lecturers at Bart, which I did not know how to interpret but clearly it wasn’t meant to be a compliment. For you, what’s discretion and what’s censorship? The first (discretion) would apply or could be considered self-inflicted and the other imposed by others (self-control or being controlled). Both terms relate to personal freedom, in a broader sense, to an individual’s position in a particular cultural and political context. Taking into consideration your previous response, do you know the work of Russian artist Pyotr Pavlensky? He recently set fire and posed in front of a Banque de France building in the Place de la Bastille in Paris. What do you think about this way of ‘art’? Can we call it art? Sadly, I have not followed this artist’s practice or the news regarding his recent action in Paris. It sounds revolutionary and Place de la Bastille in Paris is a perfect location for such an action due to its history and its symbolic value. He probably would’ve been more successful in making his point if he set fire to Bank of America or JP Morgan which are more instrumental in setting the standards of banking on the global arena. Eric Cantona (French footballer) said: ” The revolution is really easy to do these days. What’s the system? The system is built on the power of the banks. So it must be destroyed through the banks. A real revolution” (2010). Cantona has called for a mass withdrawal of funds from banks by the tens of millions of people affected by the recession around the globe. This means that the three million people with their placards on the streets, they go to the bank and they withdraw their money and the banks collapse. According to Joseph Beuys, art taken outside of its system can bring creativity into all areas of life, but can creativity of artists such as Pyotr Pavlensky really influence systems such as global banking? It would be great to believe that we can become the kings of our own destiny but, first, we have to assume that we need to coexist with others and join forces to make a real change in the world, larger than any artwork produced today. Do you know your limits? If so, can you please explain us? It would be great to think that there are no limits. I remember thinking this until quite recently. Now, I think that the only limit is one’s body. If you had the chance to give away one of your pieces, whom would you like to have it and why? I use to think that the jumpsuits I designed in 2013 in relationship to the work of Miroslaw Tichy entitled Suit for Tichý would fit well Jessie J.
I took a series of photographs inspired by the work of the British Surrealist artist Paul Nash and feel that one of them could be a good present for Nicholas Serota with whom I conversed in length about Paul Nash. I recently produced series of vases and one of them is based on the face study of Slavoj Zizek. It would be amusing to present one of the editions to him.